The Harpa Center at Reykjavik Harbor is the scene for one of the biggest annual gatherings of Arctic researchers, politicians, business representatives, indigenous peoples, nongovernmental organizations, and students; the Arctic Circle Assembly. Under the roof of this architectural landmark some two thousand participants spend a long weekend discussing a multitude of Arctic issues. This year there was an added attraction next door to the Harpa Centre: Finland, as a part of her 100 year independence celebration, had brought the multipurpose ice breaker “Nordica” to Reykjavik. A number of the assembly events were held on board the vessel, and everybody—both assembly participants and Icelanders— wanted to take the rare chance to see this impressive ship. The sea around Iceland is ice-free thanks to the Gulf Stream; hence no need for ice breakers. The official assembly program consisted of a few high-level plenary sessions and many parallel break-out sessions. IIASA and the Arctic Futures Initiative (AFI) were introduced at the assembly in 2015, and I was busy at that time introducing Pavel and Anni to my Arctic colleagues. I can safely say that the time then was effectively used to build and strengthen the network between IIASA and Arctic actors. By 2017 we were many steps ahead, as AFI has become a well-known Arctic endeavor and launching the collaboration between IIASA and the Arctic Circle was a major development. I have had the privilege to be associated with AFI over three years now, and one of the challenges for me all along has been to explain to those interested what AFI is about. 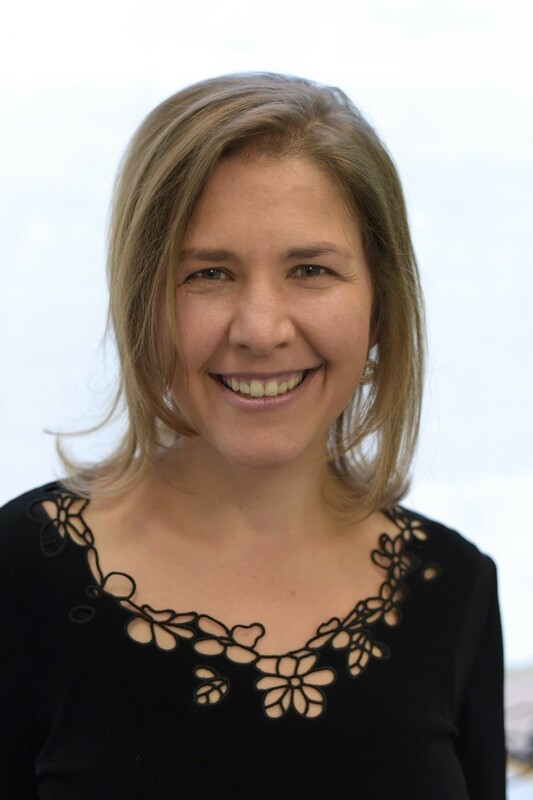 Because my background is as a diplomat and a civil servant, the concept of a research project has been something new to me—and to many other decision makers and business leaders as well. Everybody is asking what new angle can the AFI bring, and what’s in it for me? The collaboration between the Arctic Circle and AFI is a prime example on how to respond to the question. A wealth of insights and information is provided in hundreds of interventions at the assembly. What is missing is the analysis, follow up and possible implementation of the inputs during the Assembly. Here AFI can give the crucial assistance needed through systems thinking, models, and scenarios. Two years ago we had one break-out session at the assembly. This year AFI was presented by Pavel and the former President of Iceland Olafur Grimsson at a plenary, as well as in three well-attended break-out sessions covering how systems analysis perspective can be invaluable to the challenges and opportunities that the Arctic faces; how the opening of the Northern sea route might impact global trade, and Arctic fisheries assessments. The network is now largely built, the project development phase is coming to the end, and the focus of the work is shifting to carry out the project itself. But many issues still need to be tackled: who will organize and carry out the work, for example, how to solve the funding issues, and so on. I have believed in this project from the beginning. With wise and decisive action the remaining questions can be solved. “It is paradoxical, yet true, to say, that the more we know, the more ignorant we become in the absolute sense, for it is only through enlightenment that we become conscious of our limitations. Precisely one of the most gratifying results of intellectual evolution is the continuous opening up of new and greater prospects”. It is hard not to feel that we live at a pivotal moment in history, with the world racing toward an epochal crossroad. In one direction lies the path of reason, science, community and progress. A world where growing systemic challenges like climate change, resource scarcity, overpopulation, inequality, and environmental degradation can be addressed through logic, evidence, and rational, creative, and collaborative action. Where the ingenuity, collective genius, and relentless optimism of humanity can resolve complex problems such as poverty, disease, and ecological collapse, creating abundance of energy, health, education and well-being for all. In the other direction, lies a different path. One of regression, unreason, and parochialism. A fact-free, fearful and frightening world of separation, science denialism, and superstition, ruled over by demagogues offering glib, unworkable solutions, convenient scapegoats to blame, and soothing illusory retreat into fragmented tribal realms. Which path we collectively choose to follow will determine the trajectory of the 21st century and beyond. Will we choose the enlightened path of working together collectively, collaboratively, and consciously for the greater good? Or will we choose the path of darkness, disintegrating into unconscious, unreasonable and irrational behavior that hastens systemic collapse? At such a pivotal moment, the choice of “New Enlightenment” as the theme for the recent European Forum Alpbach was a timely, prescient and crucial framing. Attending the forum with my European-based colleagues from Impact Hub – a globally connected network of social entrepreneurs, innovators, and change-makers as official partners for the event – inspired hope that the path of enlightenment, reason and collaborative action is fundamentally achievable. 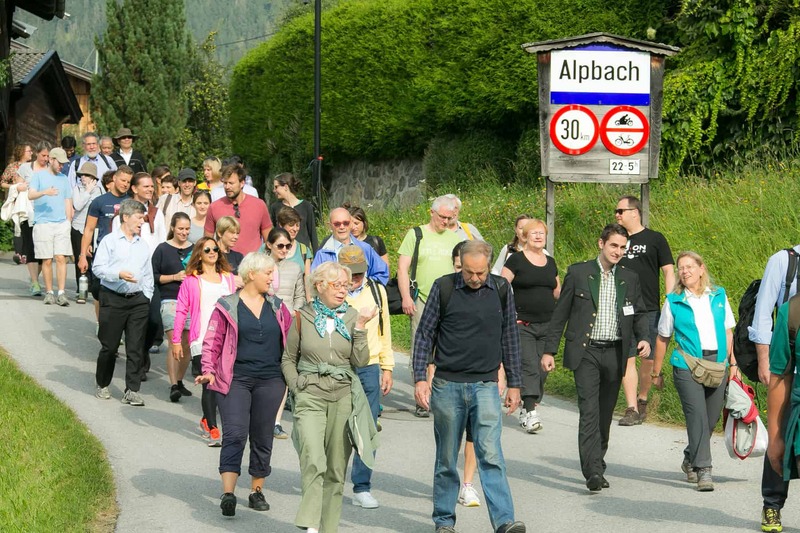 One of the highlights of the event for our contingent was a facilitated hike into the Tyrolean alps with Pavel Kabat (Director General & CEO of IIASA) and other key thought leaders from the Alpbach Laxenburg Group – including Jeffrey Sachs (Director of The Earth Institute from Columbia University), Tarja Halonen (the former President of Finland), Björn Stigson (former President of the WBCSD), Justin Yifu L in (Director of the Centre for New Structural Economics at Peking University), Pascal Lamy (former Director-General of the WTO), and many more cross-sectoral leaders from business, government, NGOs and civil society. Gathered together in the scenic environs of the Boglalm Chalet, this diverse and eclectic group focused our discussion around how we can work together to achieve the Sustainable Development Goals. Professor Sachs’ definition of an “entrepreneur” struck a chord. He described entrepreneurs as those with the vision to take elements from diverse sources, creatively combining and re- combining in new ways, key insights from different sectors, research fields, technologies, or existing systems to present a new solution or way of thinking. In that group, representing a mix of the established elite and the challengers of tomorrow, the old and the new from business, government, science, social enterprise, and civil society, it was refreshing to feel the positive energy and inspired thinking that can come from embracing and making space for an open, cross -pollination of ideas. It brought to mind a universal truth – that humanity is at its best when we work together collaboratively, breaking down barriers, dissolving silos of thought and entrenched interests and, like Professor Sachs’ concept of real entrepreneurship, combining ideas in new, innovative and creative ways. The path of enlightenment is not the domain of any one group. Political leaders can’t fix things alone – lacking the power, methodologies, community currency, and instruments required. They need business leaders, scientists, innovators, and change-agents from the social sector and civil society to bridge the gaps in dialogue, bring fresh insights and recombine them in radically new ways. As Albert Einstein famously said, “We cannot solve our problems with the same level of thinking that created them”. The path of enlightenment can only be reached through collaborative action. It is a conscious choice and one that we must come together to choose in order to avert catastrophe. “Really, the only thing that makes sense is to strive for greater collective enlightenment”. 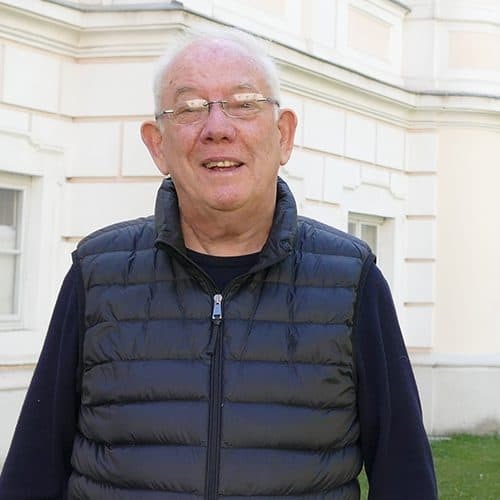 Known to the world as a metropolis of music the science in Vienna does not receive the recognition and international visibility its excellence deserves. To change this would require not so much more money but a new mindset, agree two prominent players in scientific research in Vienna: Director General and CEO of the International Institute for Applied Systems Analysis (IIASA) Professor Dr. Pavel Kabat and President of the Institute of Science and Technology Austria (IST Austria) Dr. Thomas Henzinger. How does Vienna and its scientific research community benefit from the presence of the two institutions and vice versa? Henzinger: Vienna is a hub for scientific research in Europe. There are a number of universities and institutions in Vienna and they all have an important part to play in the research ecosystem. In the end this profits everybody because as the critical mass of research grows the easier it is to hire people. It’s like gravity — big centers attract more of the best researchers from around the world. The Science Ball is a — uniquely Viennese — sign of this. We are now firmly “on the map”, and in Vienna you show that by hosting a ball! Kabat: I agree. IIASA has a number of fruitful connections with Viennese institutions. For example, IIASA and OäW have worked together to organize a series of public lectures and debates with prominent scientists for the Viennese academic and political community. Our scientific collaborations with researchers in Vienna and Austria as a whole are also very strong, and have resulted in the publication of over 1050 scientific papers since 2008. 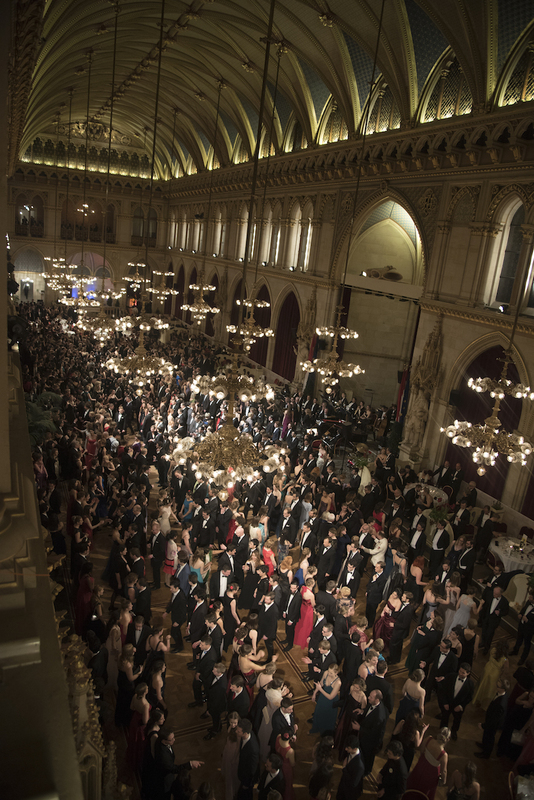 The Science Ball, bringing together Vienna’s diverse scientific community. Vienna is known as the “City of Music” because of its musical legacy, but why is science not also an important part of the city’s image? Kabat: This is something close to my heart. IIASA is doing top-level science on transitions towards sustainability; the world is now at a cross-roads and we need to be taking steps in sectors from energy and water all the way to financial systems. Communicating this can be very difficult, so we are using new and unusual collaborations that are made possible by this fantastic Viennese environment. We are working with music, ballet, and the opera. We have partnered up with the Vienna Philharmonic Orchestra, for example, and with dancers from the State Opera to communicate these complex concepts. Science and the arts both have a vital part to play in Vienna’s past and future. I dream of a scientific tour through Vienna featuring collaborations between theatres, museums, and scientific institutions. Henzinger: There is a lot of history between the golden age of science in Vienna and today, and I think there is a large amount of effort and also a lot of progress in reviving Vienna as a city for science. Science by its very nature is one of the most borderless activities of humanity there is and it can only thrive in a completely open environment. It is no surprise that the glory days of science in Vienna were when it was the hub of a multi-national empire. I think we can only get back to that by becoming much more open-minded and much more international as a country. The city of Vienna is not legally responsible for science funding, but it is a central research hub and the biggest university city in central Europe. What can the city do to improve its image as a center of scientific excellence? Kabat: I think a change is needed in the portrayal of Vienna as a whole. There is promotion of music, dance, and the arts. All these are great, but institutions like IST Austria and IIASA should also be used to show that Vienna really is one of the major science hubs of Europe and the world. Emphasizing this would require very little investment but would benefit both Vienna and science in the city. All the components are here, what it needs is a coordinated effort and a vision. 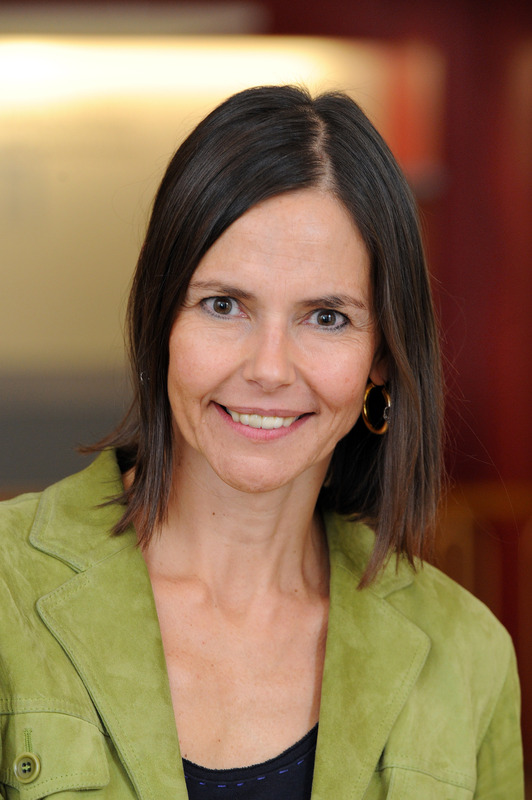 Henzinger: Vienna has an enormous advantage in that is known as a fantastic place to live. The city needs to actively attract not only world-class researchers but all kinds of science-related businesses and organizations. Vienna as a whole must make concerted effort to advertise itself as an attractive location for students, companies, and professionals from all over the world. 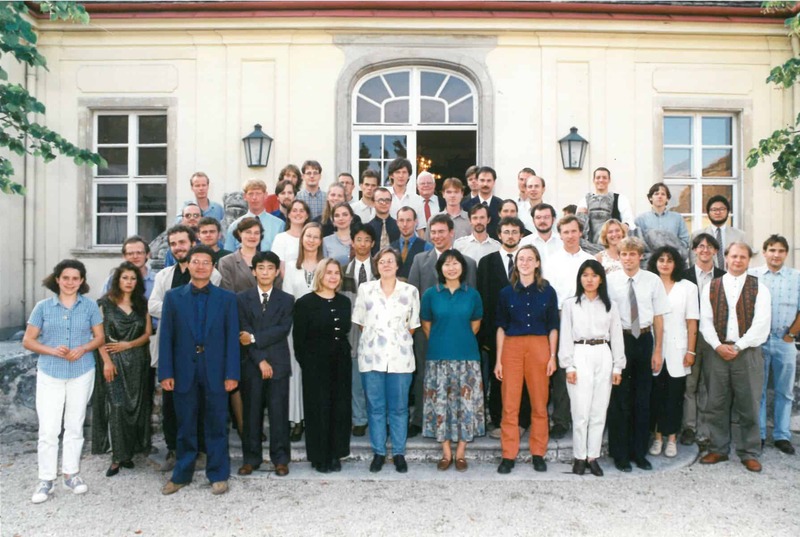 Students do not know that if they come to study at Vienna University, for example, they may also be able to benefit from collaborations with scientists working IIASA and IST Austria, who may be able to advise or even co-supervise them. This dynamic and varied environment is a key part of what Vienna can offer, not only the individual institutions. The ball is the perfect step in that direction. It is very clearly an effort that transcends any particular institution. Kabat: We should continue this talk, not just with the two of us but with all leaders of Viennese scientific institutions, and the mayor, to have a free and frank discussion. Science brings a huge amount to the city of Vienna and it should be recognized. The ball, as you say, is an excellent occasion to bring together Vienna’s vibrant scientific community and celebrate it!